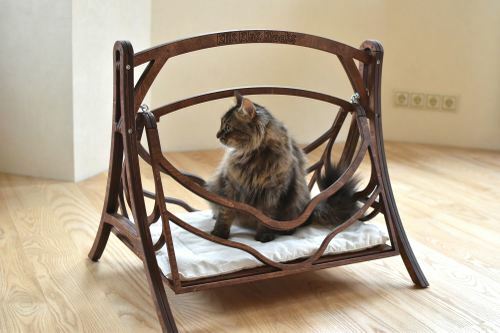 This set of wood swings is a perfect bed for cats or pets. It is made of birch plywood. The wooden basket will be a perfect place for sleeping, for playing and for having lots of fun. A completely new and unique set of a wood swing and a wood bed for cats designed by Klik Klak Blocks. The set contains a wood swing frame and a wood bed - it is possible to use the wood bed for cats separately eg. to place it on the floor or you can attach it to the swing frame. The set of wood swing is already assembled - READY TO USE right after you receive the package with the wood swing set. A wonderful cat hammock!